Colorado’s energy industry praised state regulators’ recent passage of tough new stringent regulations and oversight aimed at boosting flowline safety. On Tuesday, the Colorado Oil and Gas Conservation (COGCC) unanimously approved the rules after a months-long deliberative process involving local governments, the industry and the public at large. Industry officials believe the rules will strengthen flowline infrastructure and update the 811 “Call Before You Dig” safety program. The process began back in September 2017 at the request of Gov. John Hickenlooper (D-CO), in accordance with the governor’s August 2017 announcement of a seven-pronged approach following review of oil and gas operations that directed the state’s regulatory authority, the COGCC, to review and strengthen existing flowline rules. Throughout the process, EID has been on location for COGCC meetings and provided reporting on the robust collaboration that led to these new regulations and additional oversight. Below is a recap of key takeaways from the meetings and the new regulations. The months-long process featured diverse stakeholders, including local governments, the business community, the agricultural community, mineral right owners, and the oil and gas industry. During closing statements, there was common consensus that the process was a successful collaboration even with the broad range of varying backgrounds and viewpoints of the stakeholders involved. One of the key discussions during the process regarded a closer look at the 811 “Call Before You Dig” program versus mapping of flowlines. After hours of thoughtful, deliberative discussion, 811 won out. The reason being is that 811 best addressed concerns among stakeholders and the COGCC regarding maps on the COGCC website posing a risk to public safety in that many may rely solely on old or out-of-date information before digging in their yard, instead of contacting 811 directly, as they should under the current system. Using the 811 system, however, ensures that the most recent, up-to-date information is utilized while ensuring the safety of the community from threats of terrorism and dangerous acts of vandalism. 3) What Else Do the New Comprehensive Rules Require? In addition to requiring operators participate as Tier 1 members of the 811 one-call system, the rules also add additional requirements for flowline installation, testing, registration, and management. The new rules also requires operators to provide pipeline information about existing lines and any assets acquired from predecessors as assets change hands. Additional incident reporting was also added to the language of the revised rules. The discussion of new and emerging technology used for preventing and detecting leaks and spills from flowlines was labeled by many during Tuesday’s meeting as being “nascent.” Even the city and county of Broomfield and CPC shared this point. 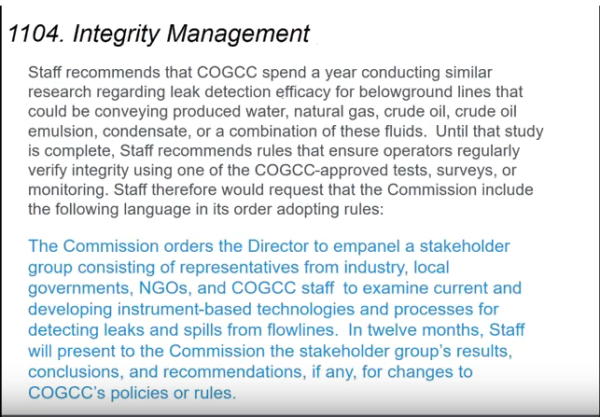 As a result, COGCC agreed on a new stakeholder working group on leak detection technology. Stakeholders will spend time reviewing new technology and reporting back to the COGCC at the end of the 12-month study. After a nearly six-month process, the COGCC’s new rules expand upon the actions already taken by the oil and gas industry as part of the recent Notice to Operators that required documentation and inspections of equipment and flowlines across the region. The new rules also expand upon existing rules of flowlines to include more flowline testing, more reporting, more monitoring and mapping by which operators will provide the COGCC with maps indicating start point and end points of flowlines. No doubt, the Colorado oil and gas industry is an important economic driver. With such a heavy weight to bear, industry has and will continue to put safety of workers and the public at the forefront of its operations.